This lesson is intended as a guide for how to view the Behavior Intervention Checklist. Please note that you will need to be in a District in order to view the Intervention Checklists. 1. Click the Behavior tab near the top of your screen. 2. Under General, click Intervention Checklist. 1. Shows the Intervention(s) Required when the Major/Minor Referral was completed. 2. Status show were the in the process is the Intervention(s). 3. Criteria shows what consequence/discipline occurred. 4. 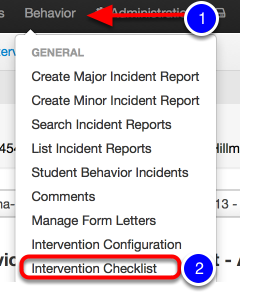 In order to make changes to the Intervention Checklist click on pencil to Edit Incident. 2. Click on the pencil to edit Interventions. 1. 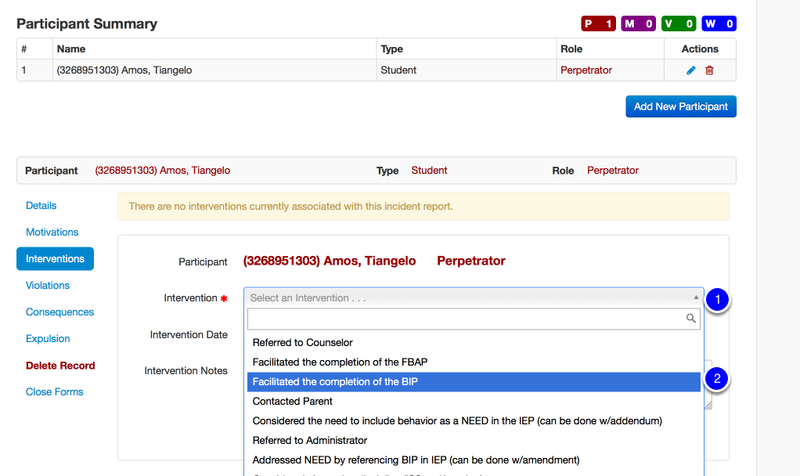 Under Details click on Interventions. 2. Select the Intervention from the list. 1. Select date Intervention was provided. 2. Add comments in Intervention Notes. 3. Click on Add Intervention. 1. Continue to add Interventions as needed. 1. After all of the required interventions from the Behavior Intervention Checklist have been completed the Status will show complete.